The best thieves in the United States operated independent crews working high-line jobs from the 1940s to the 1970s. Most of them came out of Chicago, in particular, a neighborhood known as the Patch. Meeting these people would prove vital to the creation of Michael Mann’s Thief (1981). Based on the book, The Home Invaders: Confessions of a Cat Burglar by Frank Hohimer, the film was Mann’s feature debut and lays out a thematic blueprint that his subsequent work would follow. Frank (Caan) is a top-line independent safe cracker who dreams of marrying his girlfriend Jessie (Weld) and starting a family. To make this happen, he needs to take on some quick, big-time scores. Frank makes a Faustian pact with a local crime boss (Prosky) and soon realizes that he is bound to serve the Mob for life and this so disgusts him that he takes extreme measures to assure that he never has to deal with them again. The centerpiece of Thief, as it is in Heat (1995) and The Insider (1999), is a conversation between two characters in which they espouse their worldviews to each other. This is a chance for Frank and Jessie to come clean with each other, she tells him about her past and the bad relationships she has been in. She also hints at an involvement in drug trafficking but all of this is behind her now. “My life is very ordinary, very boring which is good because it’s solid.” She is tough, honest and Frank’s equal. She does not put up with any of his nonsense and is one of the strongest female protagonists in Mann’s films despite her limited screen time. Thief is perhaps the most pure and essential variation on Mann’s themes. Frank’s entire reason for existence is to create a family with Jessie. That idea was the only thing that got him through his tough stint in prison. He carries around with him a homemade postcard that consists of a collage of the things that are important to him. For Frank it is a physical, tangible reminder of his goals. As with all Mann protagonists, he works with single-minded determination to achieve what he wants. There is a kind of desperation to his actions as he says at one point, “I have run out of time. I have lost it all. So I can’t work fast enough to catch up. I can’t run fast enough to catch up. And the only thing that catches me up is doing my magic act.” Frank is only truly complete when he is working, which is true of all the protagonists in Mann’s films. However, the deeper Frank gets in with the Mob and the tighter he tries to hold on to what is near and dear to him, the more his dream begins to slip away. The ideal of family togetherness is ultimately unattainable for Frank and so he reverts to his prison mentality where nothing matters. In keeping with Mann’s notorious habit of tinkering with his films long after their theatrical release, this version of Thief includes the extra scene from the director’s cut with legendary blues musician Willie Dixon on the bank of the Chicago River, but returns the beach sequence to its original length with the music intact. Perhaps the most contentious revision in the 1995 Director’s Cut was the awkwardly sped-up effect applied to the climactic gunfight. This version, which Criterion claims was taken from Mann’s “original 35mm answer print,” restores the slow motion effect to this gunfight. Some have claimed that the gun-metal bluish tint to this version is a new addition by Mann, but this is in fact the look of the theatrical version, which has been faithful restored to the Blu-Ray’s stunning transfer. 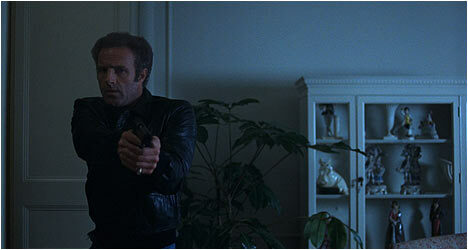 Ported over from the 1998 DVD is an audio commentary with Michael Mann and James Caan. It is interesting to note how many real-life cops and crooks worked on this film behind and in front of the camera, which Mann points out at various points. They banter back and forth like old friends and recount all kinds of filming anecdotes in this informative and engaging track. There is an interview with Mann where he talks about how growing up in Chicago influenced his fascination with cops and criminals. He provides insight into just how little of the source material was used in the film (not much) and instead drew inspiration from actual thieves. Mann also talks about his famous knack for authenticity, which included having Caan learn how to crack a safe and then do it on camera. Also included is an interview with Caan who says right from the get-go that Thief is one of the films he’s most proud of in his career. He talks about first meeting Mann and how the screenplay made him want do it. The veteran actor talks about the training he did to prepare for the role and how he interacted with cops and crooks. Caan tells some fantastic filming anecdotes. There is an interview with Johannes Schmoelling, formally of German electronic band Tangerine Dream. They composed the film’s pulsating score and he talks about joining the group back in the day. He also talks about how they got to score the film and of collaborating with Mann. He recalls the director telling them exactly what he wanted.